TopGolf Registration is now live, so get your team and sign up today! TopGolf Baseball Fundraiser, Feb 10th, starts are 5:30. 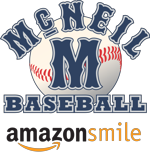 ©2019 McNeil High School Baseball / SportsEngine. All Rights Reserved.